Photo courtesy of J. B. Friday of an ‘Ōhi‘a variety that grows along streambanks. The bad news: a vitally important Hawaiian tree, the ‘Ōhiʻa, is being devastated by an invasive fungal pathogen. The good news? We’re asking for the brightest minds to help us tackle this issue and submit their ideas. Learn more about the challenges this tree faces and how you can help. Photo courtesy of Rowen Tabusa, University of Hawaii. Explaining the cultural and ecological relevance of this incredible evergreen tree is difficult, but it’s best if you don’t just think of the ‘Ōhiʻa as just a tree. To the people of Hawaii, it is so much more. 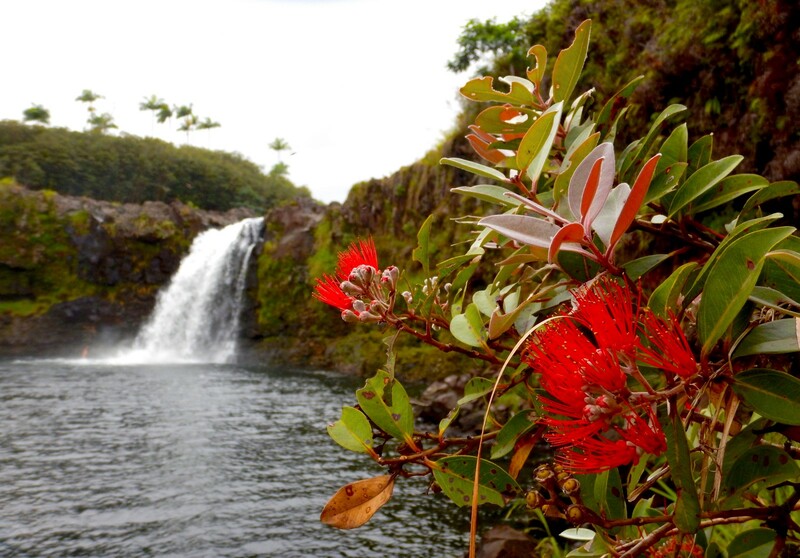 Named after a Hawaiian legend that tells of the love and separation of the young couple ʻŌhiʻa and Lehua, the ‘Ōhiʻa carries immense ecological and cultural significance in Hawai’i. The ‘Ōhiʻa (pronounced oh-hee-yah) is the beginning of a story. Once lava cools — before any other life can return — the ‘Ōhiʻa grows. It is the lone voyager, and it’s bright red blossoms and green leaves can be seen dotting barren lava fields across the big island of Hawaii. Without the ʻŌhiʻa to help bring life back to the land, the cycle of creation after a lava flow would be disrupted. Many of Hawaii’s birds, like this ‘I’iwi, evolved to feed and rely on ‘Ōhiʻa. Photo courtesy of Raymond Lara. The ‘Ōhiʻa is a cornerstone plant species that supports entire forest ecosystems across the islands of Hawai’i, including countless birds, plants and animals — some of which exist nowhere else on earth. Without it, wildlife would lose cover, food and places to roost- especially since it makes up 80% of the trees in native forests. The ‘Ōhiʻa is part of Hawai’i’s cultural heritage. The leaves and iconic red blossoms are woven into Hawaiian culture through songs, history and religious traditions. Since 2014, an invasive fungal pathogen called Rapid ‘Ōhiʻa Death (ROD) has decimated Hawaiian forests. This fungal pathogen is causing us to lose a significant number of ‘Ōhiʻa. We are working to stop this and we need your help. Photo of the ‘Ōhiʻa in bloom courtesy Christina Leopold, Hawai‘i Cooperative Studies Unit, U.S. Geological Survey. Currently, the only known visual cue of infection is when a tree’s leaves suddenly turn brown, and the tree begins to die. Once the tree’s leaves begin to turn brown, it’s already too late in the infection process to save the tree or prevent the spread of the infection. We need better detection methods. Right now, they are labor intensive, frequently requiring sample collection over challenging and rugged terrain, as well as lab analysis, either on or off-site. This fungal pathogen can affect individual trees as well as entire forests. There is a tremendous urgency among land managers, cultural practitioners, and private citizens to halt the spread of the disease. We need to get to work before it’s too late. The Challenge is open until April 8, 2019, 11:59 PM HST. Applications will be accepted through challenge.gov. Learn more about Conservation X Labs, the U.S. Department of the Interior’s Office of Native Hawaiian Relations, and the National Park Service as they are partnering on The ‘Ōhiʻa Challenge to identify advanced technological solutions to ROD. The U.S. Fish and Wildlife Service is working with others to conserve, protect, and enhance fish, wildlife, plants, and their habitats for the continuing benefit of the American people.